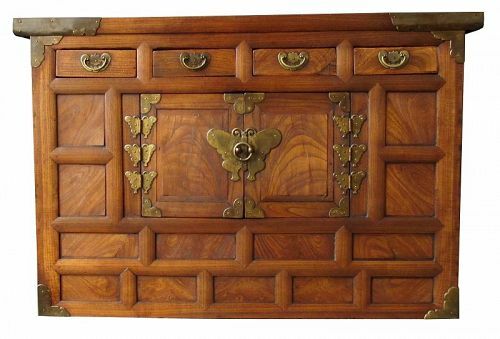 Antique Korean single section cabinet made with elm wood and hardwood burl panels. Hardware is made of brass. Beautiful rich patina. The upper portion has four small drawers in a horizontal row along the very top. 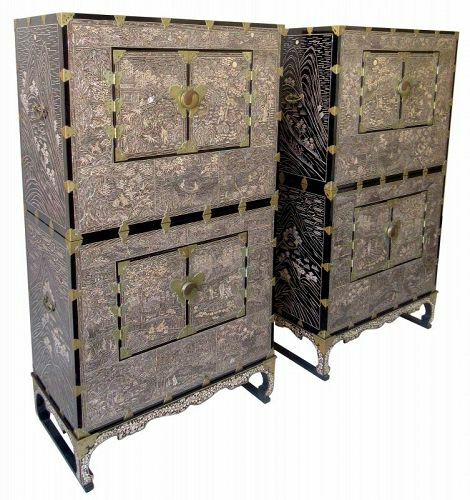 The body of the chest is mostly made up of two large compartments opened by hinged doors. 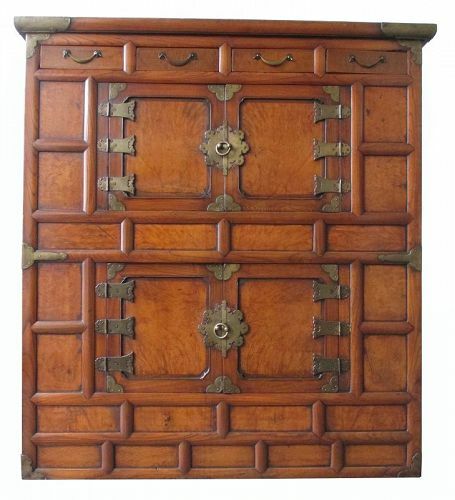 Antique Korean two section stacking personal chest with base. The front is made with hardwood burl (probably mulberry). Each section has a large compartment opened by two hinged doors. 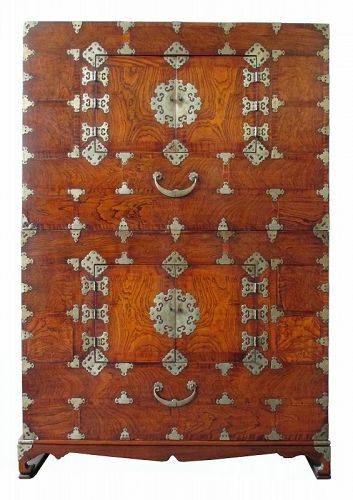 Silver colored hardware is made of chased brass. Dimensions: 52 1/4" high x 35 3/4" wide x 17 3/4" deep. 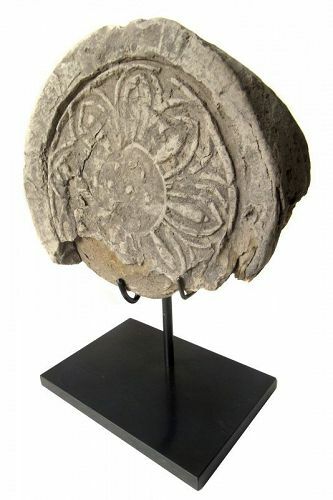 Antique Korean clay roof tile with impressed design of family crest. On custom metal stand. 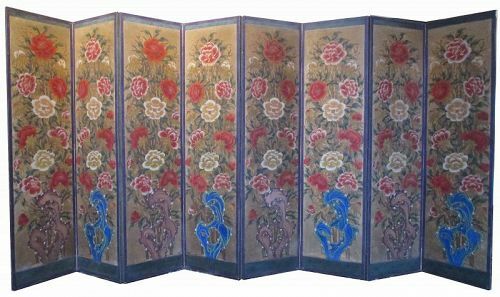 Choson Dynasty 19th century. 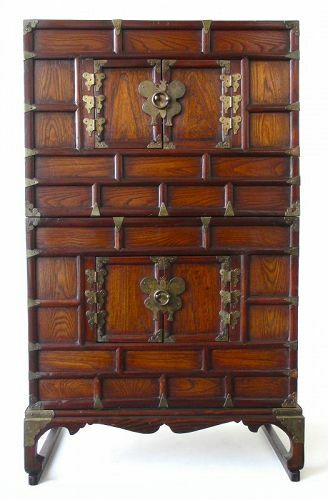 Rare antique Korean small personal stacking chest (ich'ung nong) in two sections plus a stand. 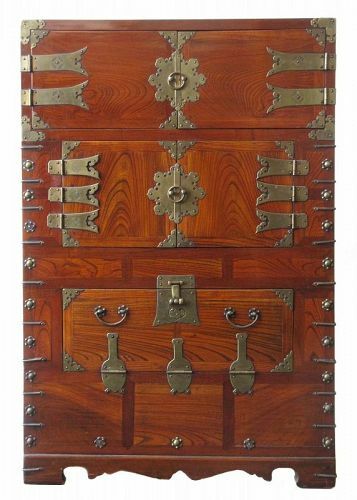 Made with multiple woods and brass hardware including butterfly shaped locks and hinges. Old paper on the inside. Chinese Han Dynasty belt hook. Made of gilt bronze with chimera motif in stippling technique. Arching form with the "hook" portion in the form of a chimera head. 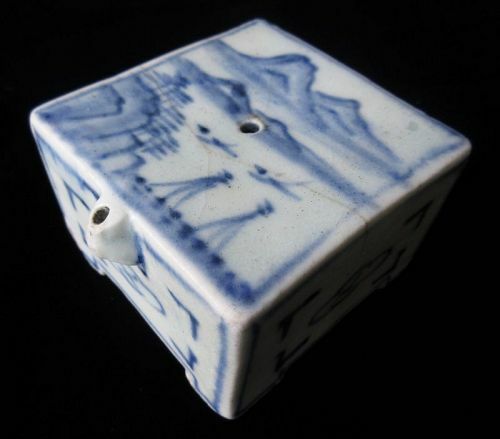 Korean blue and white porcelain water dropper in a squared form. The top surface adorned with cobalt blue underglaze landscape scene of mountains and boats and its sides with cobalt blue geometric motifs. The piece stands on four L shaped feet. With old crazing.